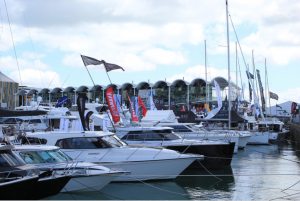 The Auckland On Water Boat Show ran over the first weekend in October and exhibitors are reporting strong sales and a buoyant industry. A drawcard of this year’s show was the presence of the America’s Cup and the Volvo Ocean Race trophy, with the coming events set to add an extra shot of impetus to the NZ Marine Industry. “The feedback we got from exhibitors was that customers were positive and ready to buy, and that the America’s Cup win had strengthened interest in sailing and getting out on the water,” said Stacey Cook, boat show manager. Repeat exhibitors reported increased sales figures when comparing their year on year sales. “We received a record number of deposits for brand new Tristram packages at this year’s boat show, for delivery in 2018. The weather was brilliant for the majority of the show, and boat show visitors enjoyed viewing the filming boats and chatting to the team from Big Angry Fish TV on the Tristram stand,” said Kingsley Fink, Tristram Marine general manager. Whangaparaoa’s Gulfland Marine was enthusiastic about the willingness of consumers in the New Zealand marine market to purchase goods. “I had to run around looking for a fire extinguisher, as sales and positivity of customers were on fire,” said general manager Craig Lewis. Boats exhibited included a number of firsts. Luxury brand Monte Carlo was seen in New Zealand for the first time, and presented by 36 Degrees Brokers, who pinpoint the 16-metre range as the perfect large luxury cruiser that will fit into readily available New Zealand berths. The 19th edition of the show included a number of seminars, a range of inboard and outboard engines, solar technology, electronics, navigation, safety devices, fishing equipment, kayaks and other watersports equipment, alongside a huge array of motor and sailing vessels on the water.